Brian Bellows spent the last part of the 1997-1998 season and the entire 1998-1999 season with the Washington Capitals. The Caps turned out to be the last team for which he played. While his tenure with the team was not long, it was quite memorable as he helped the team make it to the Stanley Cup Finals for the only time in franchise history. Bellows was born on September 1, 1964 in St. Catherine’s, Ontario, and was drafted by the Minnesota North Stars in 1982 with the second pick overall. He ended up playing ten seasons and 753 games with the North Stars, scoring 342 goals and 380 assists, for 722 points overall. The North Stars had named him Captain in his second year with the team, making him one of the youngest players in NHL history to achieve top leadership duties. During those ten seasons, he had scored more than 20 goals in all of them, scoring 50 goals one time – 1989-1990, topping 40 goals two other times, and topping 30 goals four more times. Bellows was traded to the Montreal Canadiens after the 1991-1992 season in exchange for Russ Courtnall. He stayed with the Canadiens for three seasons and had 81 goals and 94 assists with them. After that, he spent two years with the Tampa Bay Lightning and one year with the Mighty Ducks of Anaheim. 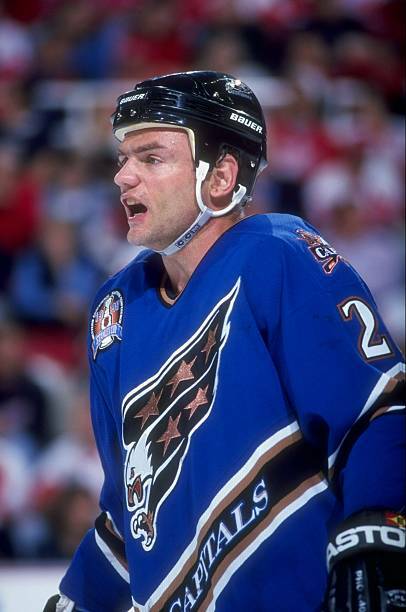 After the 1996-1997 season, Bellows signed a contract to play with the Berlin Capitals in Germany given that the Ducks had chosen not to re-sign him, and the Vancouver Canucks had cut him during training camp. Many observers assumed his NHL career was over. While in Germany, he also began preparing for his post-NHL life, studying his business text books in hopes of finishing his degree in Business at St Thomas University. Bellows did well playing hockey in Germany, scoring 15 goals and earning 17 assists. In March 1998, the Washington Capitals General Manager, George McPhee, signed Bellows to a $50,000 contract for the season’s final 11 games. He would also get another $50,000 if the team did not re-sign him that summer. The Capitals needed him because forwards Richard Zednik and Jaroslav Svejkovsky were dealing with injuries. “I knew around the Olympic break that I had about five weeks to find a job if I was going to have one more shot in the NHL, even though I had resigned myself to finishing school and starting work,” said Bellows, afterwards. This time frame was even more difficult for Bellows’ wife, Tracy, as she had a miscarriage. She miscarried just four days before Vancouver released him from training camp. She had gotten pregnant again while he played in Germany and was having a difficult time with this pregnancy. In fact, she had to return to the United States for medical care after some complications and had to remain in Minnesota even after her husband signed with the Caps. McPhee signed him on March 20 and had him sit at his home in St Paul, Minnesota for nearly a week before putting him on waivers on March 25, the NHL’s trade deadline day. At that time, the rule was that any player returning to the NHL from Europe had to clear waivers, but any player claimed on March 25 would not be eligible to play in the playoffs. Since Washington had signed him on March 20, he would still be eligible for the playoffs. Bellows had immediate success with Washington. He was placed on a line with Joe Juneau and Adam Oates and had 6 goals and 3 assists in the team’s final 11 games. For the playoffs, he scored 6 goals and 7 assists as the Caps advanced to the Stanley Cup Finals, only to get swept by the Detroit Red Wings. Meanwhile, his wife’s pregnancy progressed. While the baby was due on July 3, because Tracy was already having contractions, the doctors decided to induce labor on June 10. Caps owner, Abe Pollin, made his private plane available to fly Bellows from Detroit after Game 1 to Minnesota so that he could witness the birth of his child and then fly him back to Detroit afterwards – in time for the morning skate for Game 2 of the Stanley Cup Finals. The baby was born that afternoon (2:00 p.m.) at Fairview Southdale Hospital in Edina, Minn. It was a boy – Kieffer Sullivan Bellows (2018 Team USA WJC Player), who weighed in at 7 pounds. It was the couple’s second child, as they already had a 3-year old girl named Brianna. Afterwards, Bellows returned to the team in time for Game 2. Bellows played one more season with the Caps, 1998-1999, and scored 17 goals and had 19 assists. That season, he scored his 1,000th career point, in a game against Toronto on January 2, 1999 and became the 54th player in the NHL to reach that career milestone. He scored a goal in the second period of that game to reach 999 and then assisted on a goal by Jeff Toms for the 1,000th point. After that season, he retired, finished his degree, and went to work in the finance industry with Piper Jaffray. Like his dad, Kieffer also became interested in hockey. He played for one season with the Boston University Terriers, was drafted by the New York Islanders with the 19th pick in the 2016 NHL Draft and represented the United States at the 2018 World Junior Games. He currently plays junior hockey with the Portland Winterhawks (WHL). This entry was posted in History, News, Players, Roster Moves, Washington Capitals and tagged 1997-1998 Season, Alumni Profile, Brian Bellows, Capitals History, Kieffer Bellows, Washington Capitals Alumni, World Juniors. Bookmark the permalink.